Using a Pedal Exerciser is an ideal way to help keep active, restore muscle strength, co-ordination and improve circulation to the lower and upper body. Easily tone muscles and burn off calories at home, in privacy and comfort. 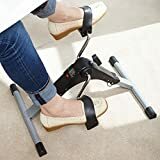 While sitting in your chair, use it as a bike to exercise calves, hips and thighs, or on a table, handcranking the pedals to target forearms, upper arms and shoulders. And adjusting the resistance helps you to get stronger and fitter. Its clear LCD screen shows time, number of revolutions and calories burned. Lightweight and foldable, it’s portable to use anywhere. Lightweight steel frame with a chrome finish and non-slip rubber grips. Folds away for easy storage. L47xH37xW25cm.